Okonomiyaki is a Japanese pancake made with cabbage, eggs, seafood, meats and lots of great seasonings. In Japan you can go into tiny places and they bring you the ingredients and you cook them right on a grill at your table. There are also nice restaurants that serve a fancier sort of Okonomiyaki. 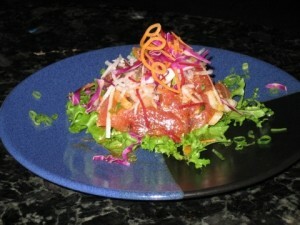 For our first course we had Ahi Poke. This is cubed, sashimi grade Ahi, seasoned and topped with Daikon and carrots. The Ahi was so fresh it just melted in our mouths. 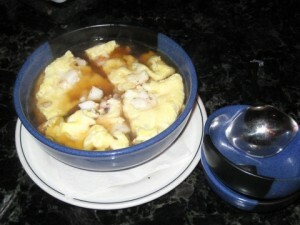 Our second course was Pei; steamed egg and seafood soaked in Japanese consume. 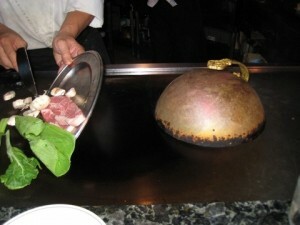 The chef cooked the seafood inside a metal ring, added the eggs on top and place a lid over the top to steam. This wasn’t just an ordinary lid, it was copper with a beautiful handle on it that looked like it had been around a long time. He told us 21 years. 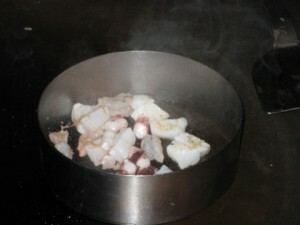 He then placed the steamed mixture in a bowl and poured the consume over the top. 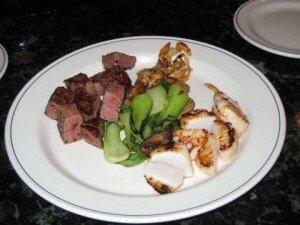 The fourth course was A Teppanyaki of Garlic Shrimp and Filet Mignon. For ken he prepared Scallops to substitute for the filet. It was served with bok choy, button mushrooms and these little slivers of crispy fried garlic. 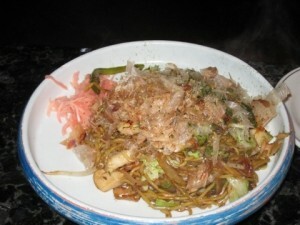 For course five we selected the Seafood Yakisoba. This is a noodle dish. 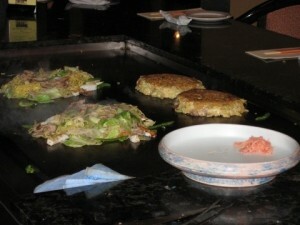 Our other options were choices of different styles of Okonomiyaki, which is the cabbage dish. 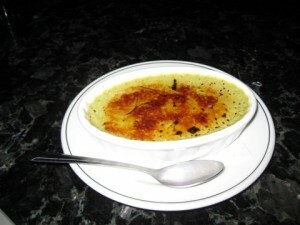 To finish off we had Macha (green tea) crème brûlée. This was a light and refreshing dish to finish our meal. This is one I’ll have to try making at home. We loved everything about this meal and the price was fantastic at $80 for two. I’m betting we eat diner there again on our way back from Australia in two weeks.